That practice, known as phreaking, involved such luminaries as Steve Jobs, Steve Wozniak and John Draper, known as Cap'n Crunch, who used a whistle from a cereal box to meddle with AT&T's long-distance trunk lines. But South Korean researchers say they've found several weaknesses in VoLTE networks in the U.S. and South Korea. The fault also lies in part with operators, which haven't full vetted their infrastructure for security issues. Also, LTE standards have been implemented in different ways by operators, opening up a variety security holes. "Basically, there are mistakes and things they have overlooked," said Yongdae Kim, a professor with the Korea Advanced Institute of Science and Technology's (KAIST) electrical engineering department, in a phone interview Tuesday. T-Mobile, Verizon and AT&T were notified of the issues in May, according to an advisory updated on Monday from Carnegie Mellon University's CERT. None of the companies had an immediate comment. CERT's alert said each operator's problems are different and will require them to apply their own updates, which may take time. Google said it is working on a software patch for Android which will be released next month. Apple's mobile operating system, iOS, is not affected, according to CERT. Android's problem is with its permissions. On 3G networks, there are separate network domains for data packets going over the Internet and phone calls, which go through circuits. But with LTE, voice and data go over Internet. Android's permission that governs phone calls doesn't matter since calls are no longer going through a circuit-switched network, Kim said. 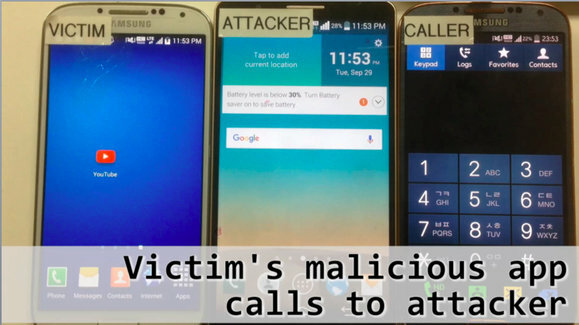 In this example, a malicious app on a victim's Android phone secretly makes a call in the background, blocking the victim from making a call. Android won't recognize that a data call is being made and show nothing on a smartphone's screen. A video call could eat up the victim's data allowance and potentially garner them a huge bill. The vulnerabilities on the operator side could also lead to some crippling attacks, Kim said. With 3G networks, people can only make one call at a time. But over packet-switched networks without the right controls, many calls can be made. Kim said the error some operators have made is not managing call sessions. A device, for example, could start multiple calls with an operator's SIP (Session Initiation Protocol) server. If the number of connections is too large, it could damage the SIP server and paralyze the IP Multimedia Subsystem (IMS), which manages IP-based voice calls for VoLTE, according to the paper. The solution is limiting the number of SIP messages that can sent by a mobile device and blocking activity that appears malicious. with Tolaga Research in Newton, Massachusetts. As the mobile industry moves to packet-switched services and mobile signaling is more exposed, more attack surfaces are likely to emerge, Marshall said. "Although there are technical solutions to address these and other threats, we are generally not yet seeing the mobile industry placing adequate priority towards security," he said.